Near the town of Ramsey, Huntingdonshire, is a historical treasure, the Ramsey Rural Museum. The Museum is managed and maintained by volunteers and is both quaint and informative. Housed in renovated 17th century farm buildings, the Museum exhibits include over 200 years of local history. I visited the Museum briefly in 2010 and while I had a quick look around the war exhibits, I missed seeing a most interesting display which included a fragment of Josef Jakob's parachute. 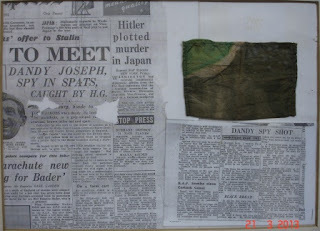 A contact at the Museum kindly sent me a picture of the display which I blogged about Josef's parachute gear a couple of years ago. In August of last year, in conjunction with the Ramsey 1940s Weekend celebrations, I wrote a letter to the organizers of the weekend asking them for assistance in contacting the descendants of the locals who originally encountered Josef. I didn't hear back from the Ramsey Weekend people but, last month, I learned through Martyn Smith, that the Ramsey Rural Museum had posted a display on the story of Josef Jakobs and included my letter as part of the display. 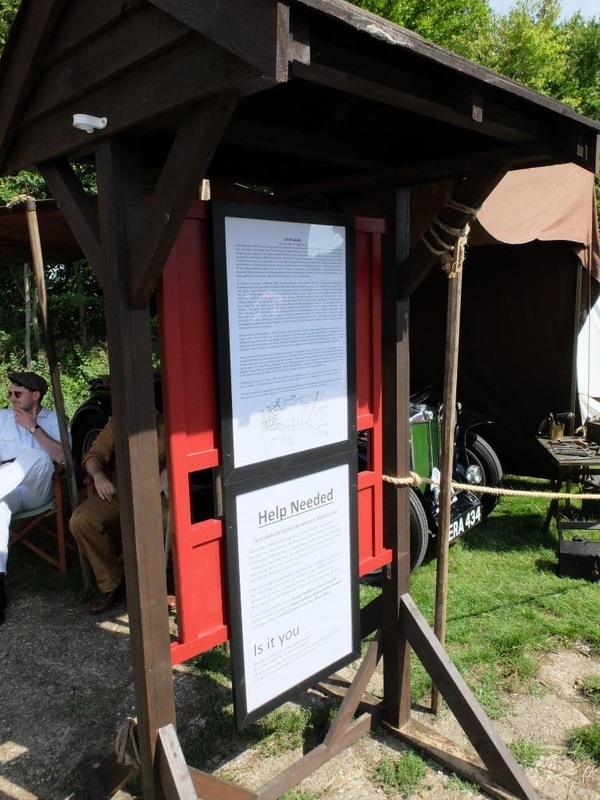 The first part of the display tells the story of how Josef landed at Dovehouse Farm on the night of 31 January, 1941, with a broken ankle. After spending a night in agony, he fired his pistol into the air the following morning, attracting the attention of two local farmers. The farmers contacted the Ramsey Police, who contacted the Home Guard, and the rest is history. Josef Jakobs the Germany Spy captured in Ramsey in 1941. 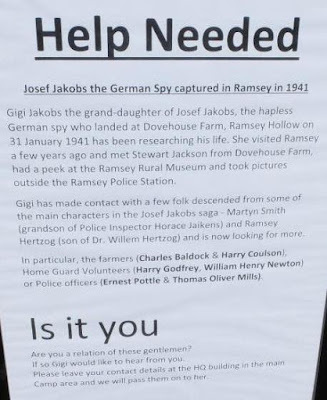 Gigi Jakobs the grand-daughter of Josef Jakobs, the hapless German spy who landed at Dovehouse Farm, Ramsey Hollow on 31 January 1941, has been researching his life. She visited Ramsey a few years ago and met Stewart Jackson from Dovehouse Farm, had a peek at the Ramsey Rural Museum and took pictures outside the Ramsey Police Station. Gigi has made contact with a few folk descended from some of the main characters in the Josef Jakobs' saga. Martyn Smith (grandson of Police Inspector Horace Jaikens) and Ramsey Hertzog (son of Dr. Willem Hertzog) and is now looking for more. In particular, the farmers (Charles Baldock & Harry Coulson), Home Guard Volunteers (Harry Godfrey, William Henry Newton) or Police Officers (Ernest Pottle & Thomas Oliver Mills). Are you a relation of these gentlemn? If so Gigi would like to hear from you. Please leave your contact details at the HQ Building in the main Camp area and we will pass them on to her. It would appear from the context of the questions, that the display was posted at the Ramsey 1940s Weekend but, alas, to date, it has generated no leads. Although, there is always tomorrow. Or the next day.